The service manual for the Dell XPS 15 9570 has been posted online and it looks like the notebook will sport a similar heatsink design with 2 heat pipes as its predecessor. This raises concerns about the possible throttling issues as the previous XPS 15 9560 had to be undervolted and thermal pads applied to the VRMs in order to prevent performance drops due to thermal throttling and power limits. 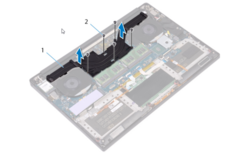 The service manual for the Dell XPS 15 9570 is now available and it reveals something that we wished would improve in this generation — that the XPS 15 9570 carries over the same 2-pipe heatsink assembly from the previous generation. Not just that, there is also no indication of improved thermal dissipation from the Voltage Regulator Modules (VRMs) implying that we could be in for some serious throttling issues. The Dell XPS 15 while earning accolades for being a very capable multimedia laptop that can also game, has also earned the reputation for throttling heavily under load. Previous generation XPS 15s such as the 9550 and the 9560 have been known to throttle when stressed, leading to drastic performance drops. Both the earlier XPS 15s suffered from both thermal and power-limit throttling. The only way to fix this was to repaste and undervolt the CPU and also apply thermal pads on the VRMs to drive away all the excess heat. Unfortunately, it looks like Dell has chosen to retain the existing heatsink design for the XPS 15 9570. So far, the 2-pipe heatsink design did little to alleviate the increased thermals under load and we are somewhat concerned that history will repeat itself. A 2-pipe heatsink is barely adequate to cool the new 45W Intel 'Coffee Lake-H' CPUs and the NVIDIA GeForce GTX 1050 Ti GPU. This could be one of the reasons why Dell has chosen to go with the Max-Q version of the 1050 Ti although, the official Dell specifications do not mention it explicitly. A 3-pipe heatsink would have at least covered the VRMs and helped prevent them from reaching power-limits and subsequent performance drops. Compounding throttling fears is the availability of a Core i9-8950HK variant and whether it can actually sustain the 4.8 GHz boost. While an official service manual is a valid reference, it could be that the content in the manual was sort of rushed up with diagrams from older versions. The only way to ascertain this is to wait till we get our hands on a unit and subject it to our tests. Dell does have features such as the Dynamic Power Policy to prevent internals from getting roasted by regulating power supply to individual components under different loads but we will have to see how well it benefits the new CPU+GPU combination.